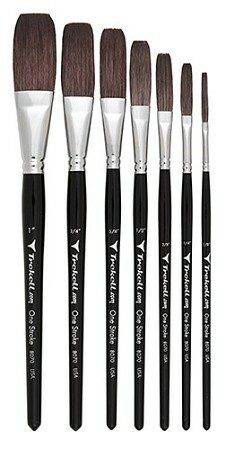 Trekell's One Stroke Brush went through a meticulous design process to ensure it excels at lettering. Utilizing the versatility and maneuverability of its pinstriping lineage, the One Stroke Brush goes across a painting surface smoothly without a hint of drag. Apply pressure to the 6" black handle to fatten-up lines or ease-back for daintier strokes; either way, you're treated to the cleanliness and clarity that are true Trekell qualities. However you use one, a One Stroke Brush makes its mark.